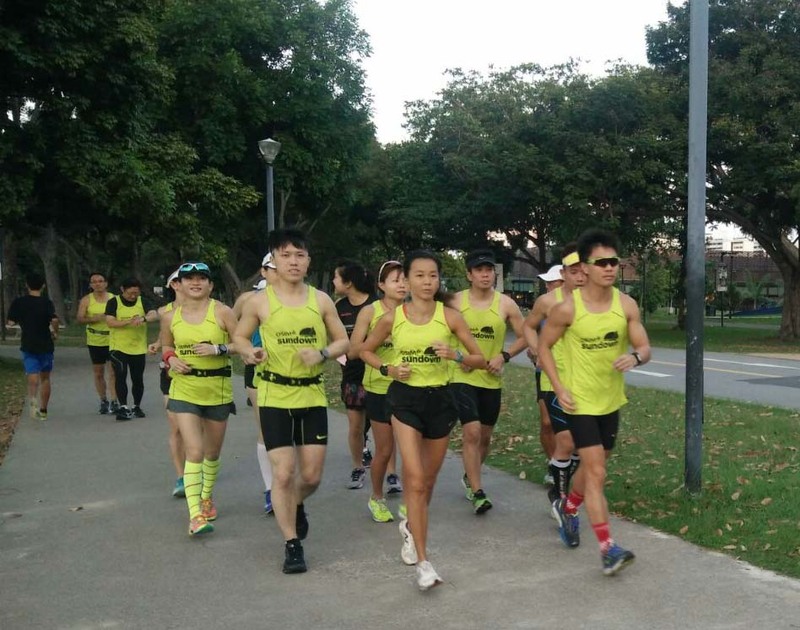 The NightHawks entered into week 9 of Sundown Marathon training with the longest run from Marine Cove, ECP. 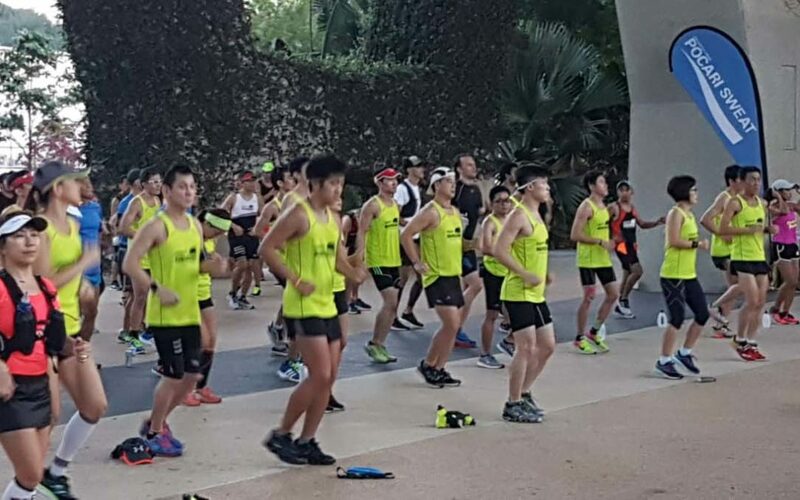 Led by the Sundown Marathon Pacers who were into week 12 of Pacer Training, the respective pace groups completed long runs of 22km (HM) and 32-35km (FM) at Optimal Pace, in spite of the seething heat. 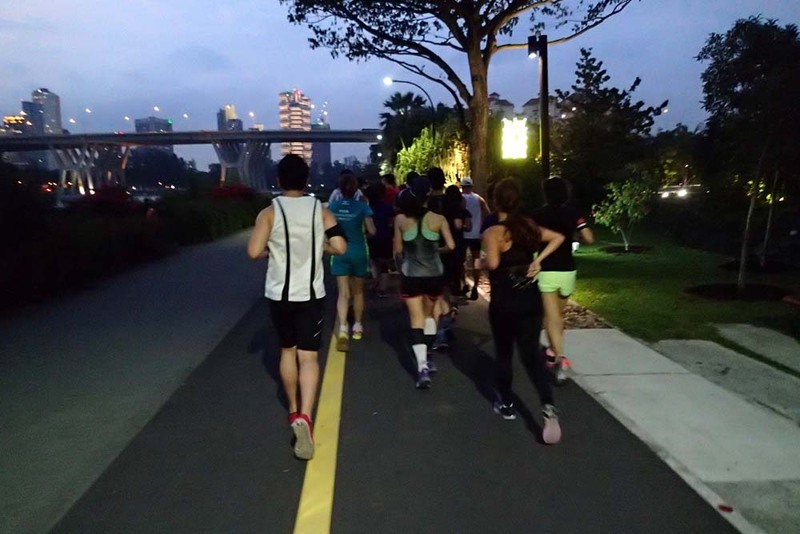 With the foundation of 8 weeks of basebuild and pace training, the NightHawks were looking strong in the first part of the training run with transition from Marathon Pace to Optimal Pace after a 3-5km warm up segment. 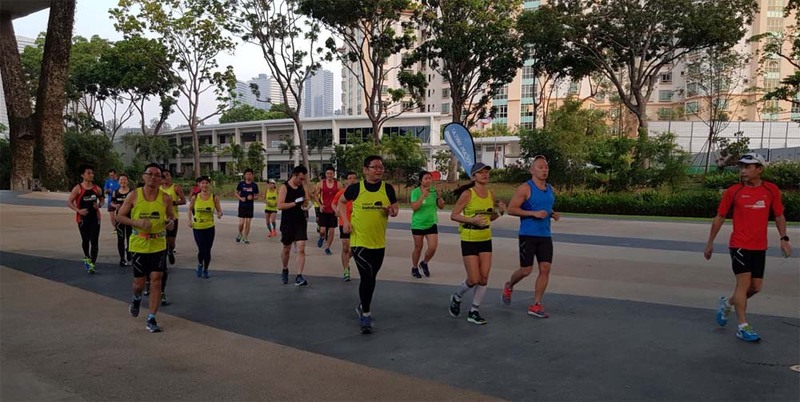 Still it was a herculean and commendable effort from the NightHawks and Sundown Pacers in completing their training mission in the longest run and in very challenging weather conditions to say the least. 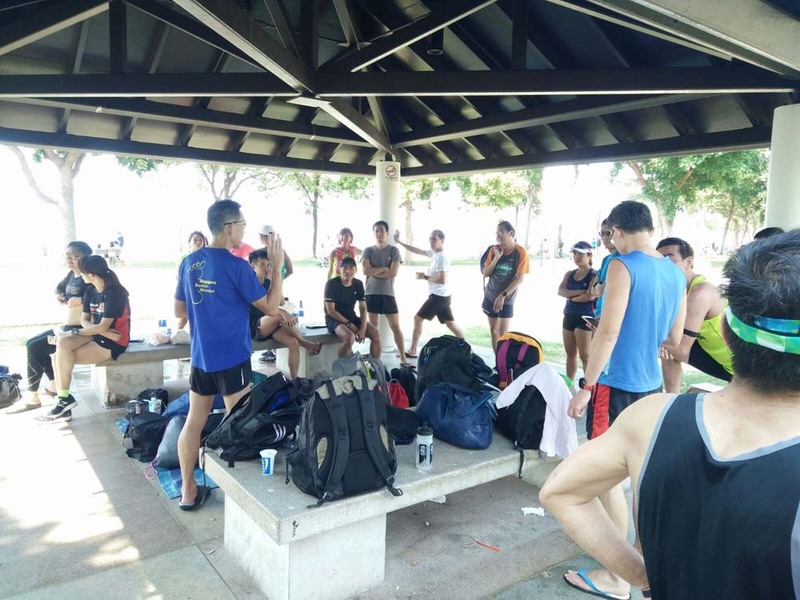 The NightHawks are primed for a good Sundown race in less than a month’s time. They will be looking forward to the tapering phase which will start from next week. 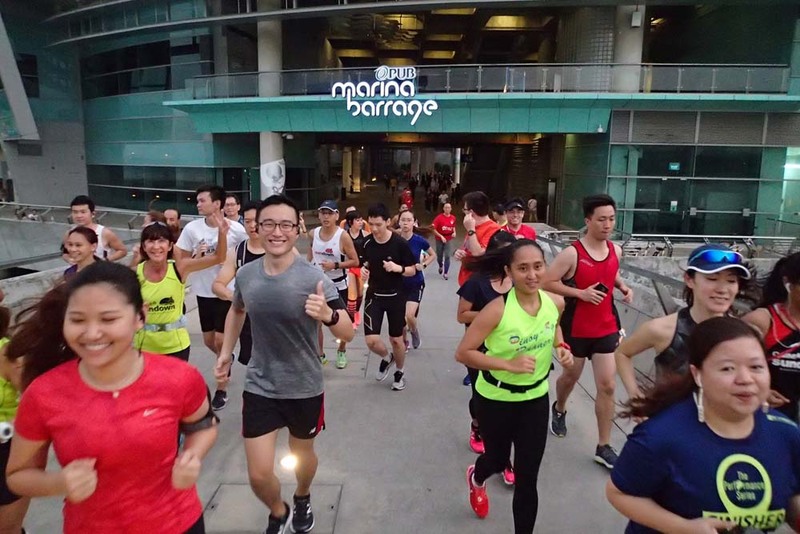 The most important thing for the trainees are to avoid catching any flu bug and remaining injury-free during this final period leading up to race night. 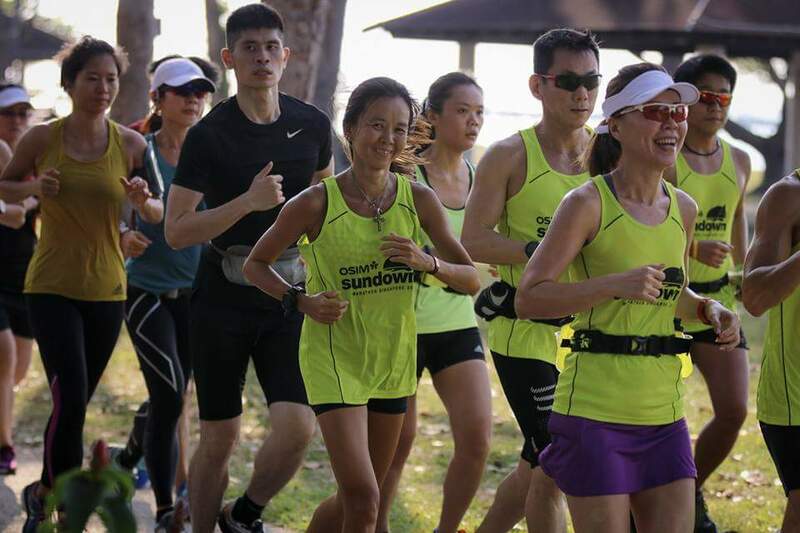 The 3rd and final Sundown Lead Up Run saw a record turnout of Sundown Marathoners looking to clock their longest run at Marathon to Optimal Pace. 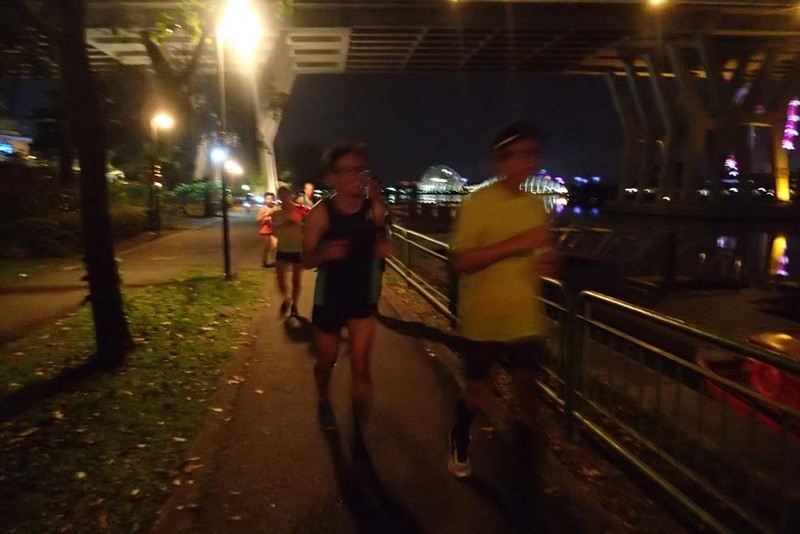 The night long run was also important to condition for the challenges of night distance running on race night. 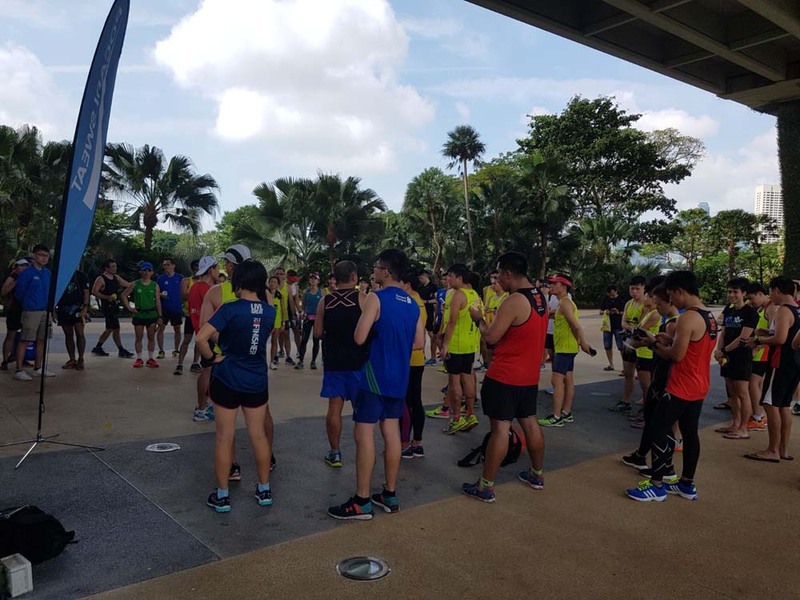 After allocating runners to their respective pace groups and Sundown Pacers, a thorough training run briefing was conducted. 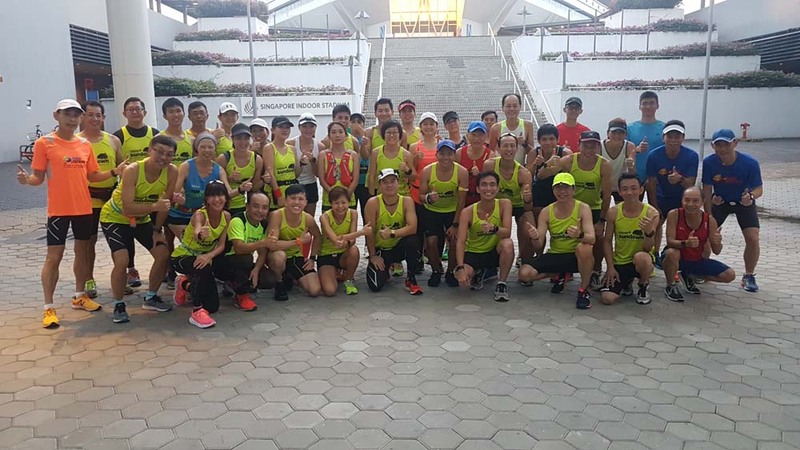 That was followed by a group photo before getting into the thick of things with a 10min muscle and joints ‘looseners’ and dynamic running drills led by Sundown Pacers. 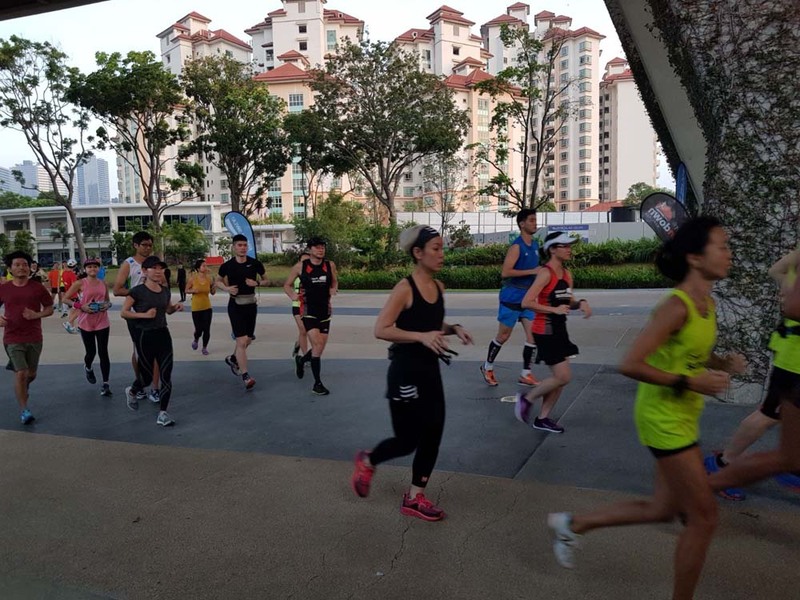 The weather was cool after the late afternoon showers, although the humidity was still rather high – good conditioning as it can be humid running in the wee hours of a Singapore morning. 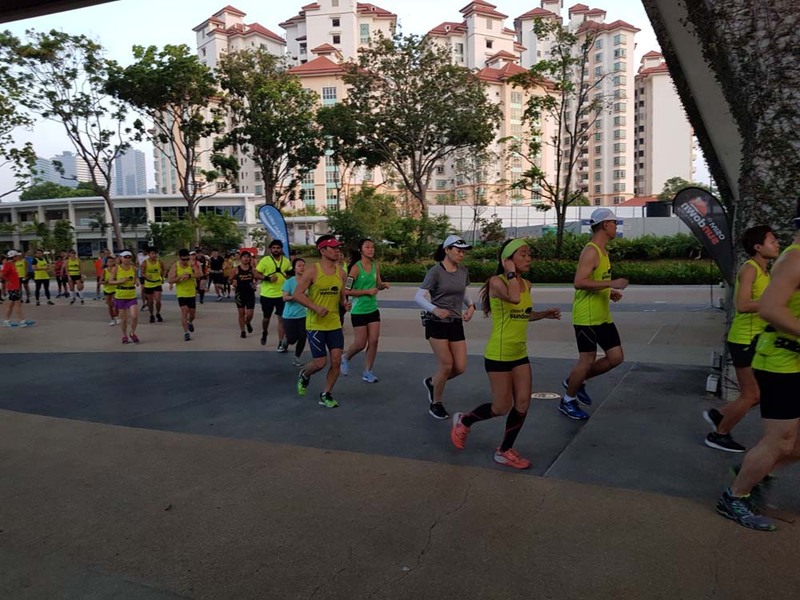 The respective pace groups were flagged off in the direction of Tanjong Rhu leading into East Coast Parkway – familiarization with segments of the Sundown race route. 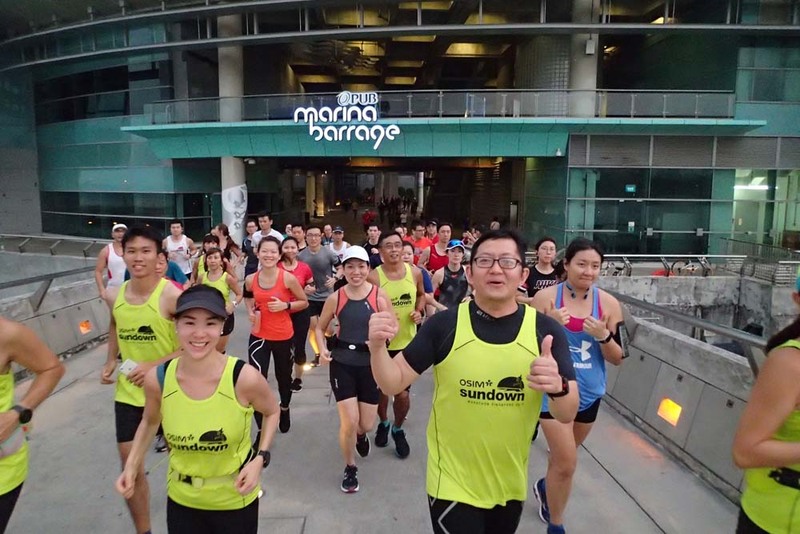 Energy levels were high and the serious faces of the Sundown Runners showed that they meant business at this longest lead up run. 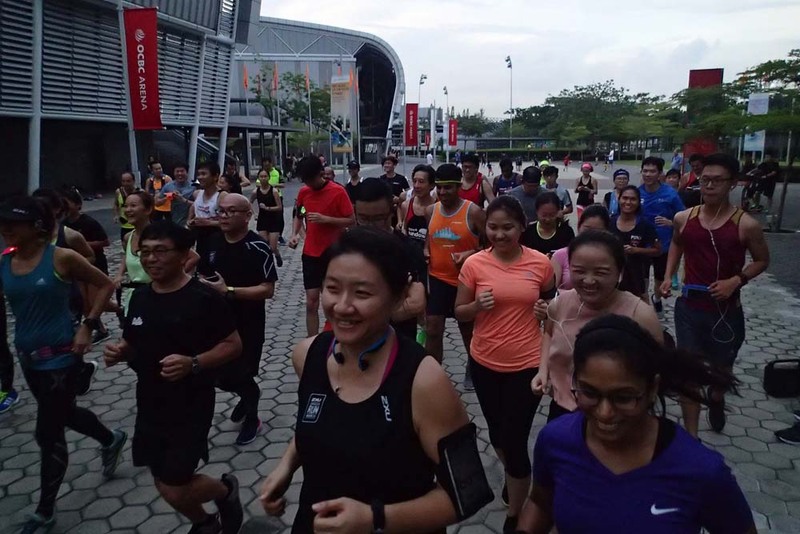 The Half Marathoners (HM) were to run 19km @ Optimal Pace (7s faster than target Marathon Pace) in a out and back route with U-Turn at the ECP Food Centre. 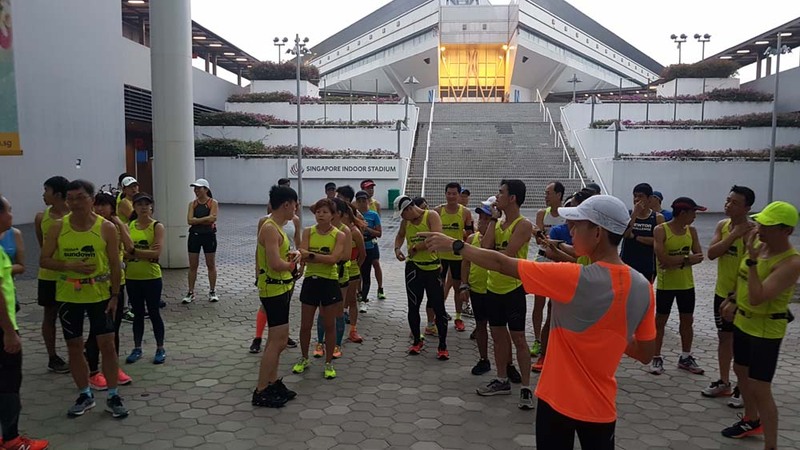 The Full Marathoners (FM) were to test 30km @ Optimal Pace with the first 5km @ Marathon Pace in an out and back route with U-Turn at NSRCC. 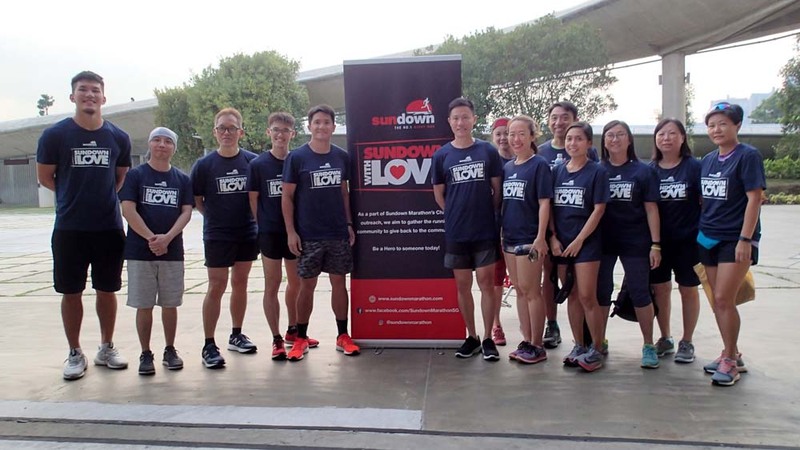 The Sundown Runners ran strong in the first half of the distance with most of them sticking to their respective pace groups. 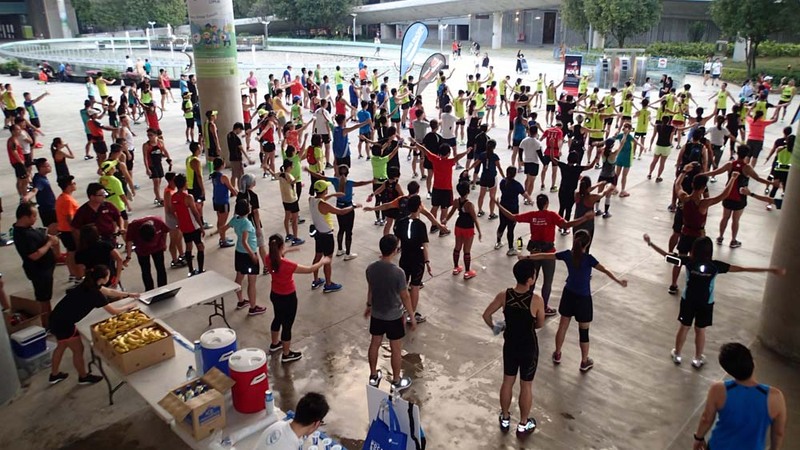 The Pocari Sweat hydration points were warmly welcomed by all the runners, especially in such humid conditions. 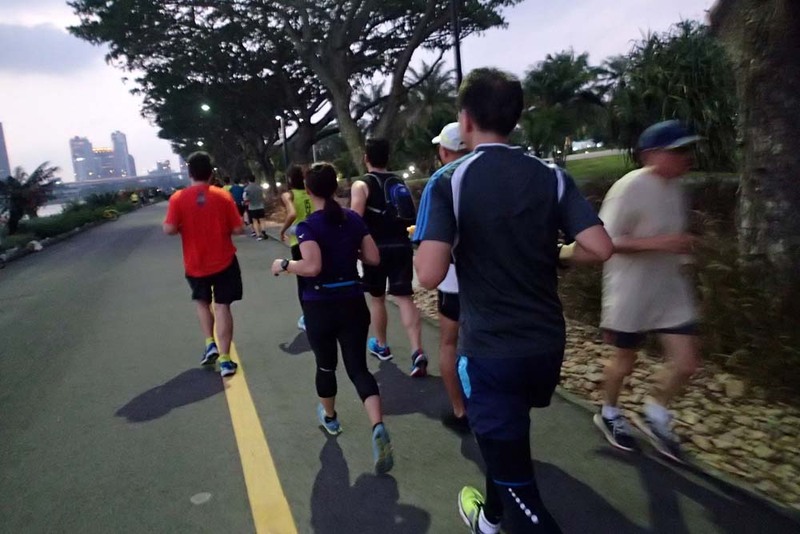 Most of the Sundown Runners stayed with the pace for at least 3/4 of the distance before a few slowed down slightly as the night wore on. 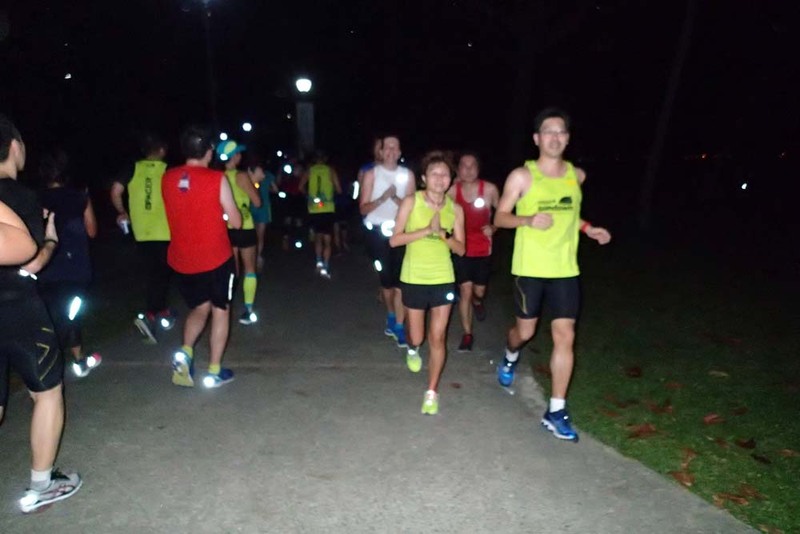 All the Pace Groups returned to the start point within regulation time of 240min (4hrs) with no stragglers. Certainly impressive! 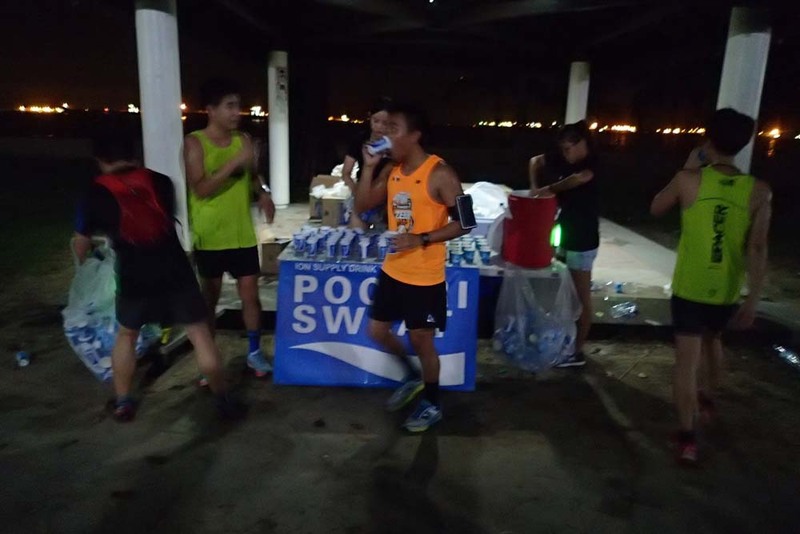 They were rewarded with bananas and more Pocari Sweat. 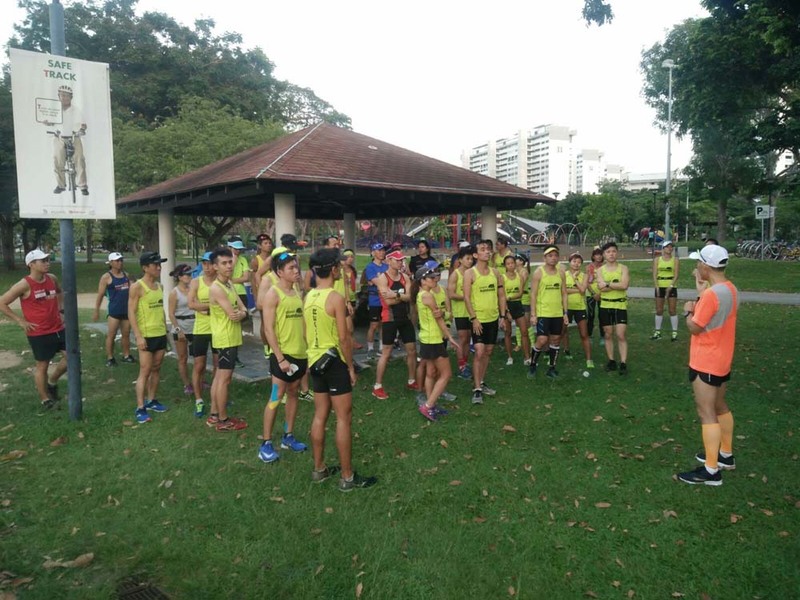 Respective Pace groups took photos and were given debrief and some tips on nutrition, hydration, training runs and race night preparation. 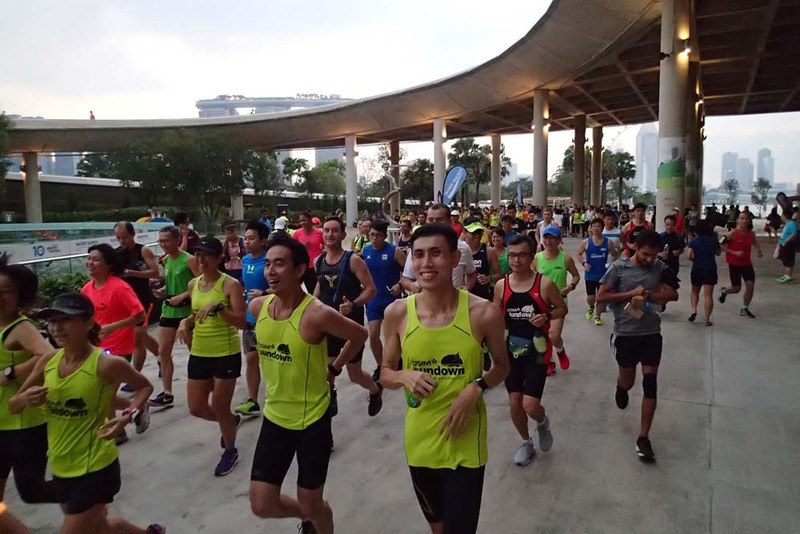 The longest night run wraps up a successful Sundown 2018 Lead Up Run series. 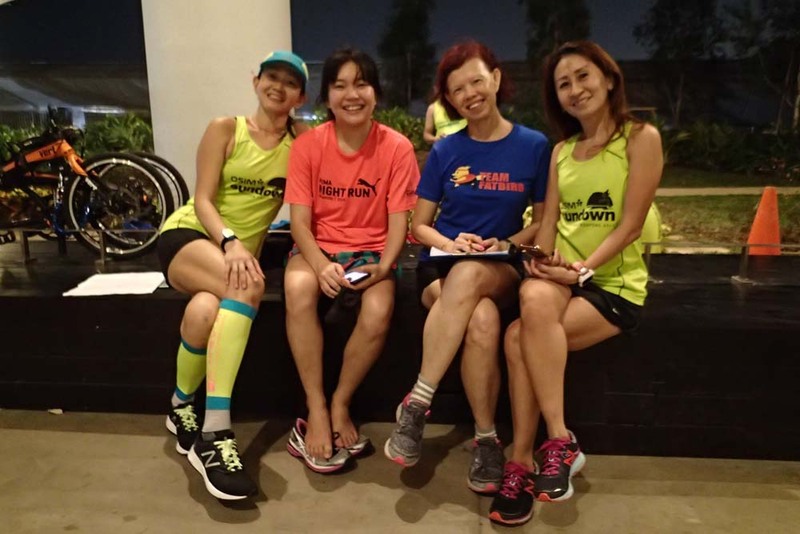 Team FatBird would like to wish all Sundown Marathoners a good and fruitful Sundown Marathon on May 19. 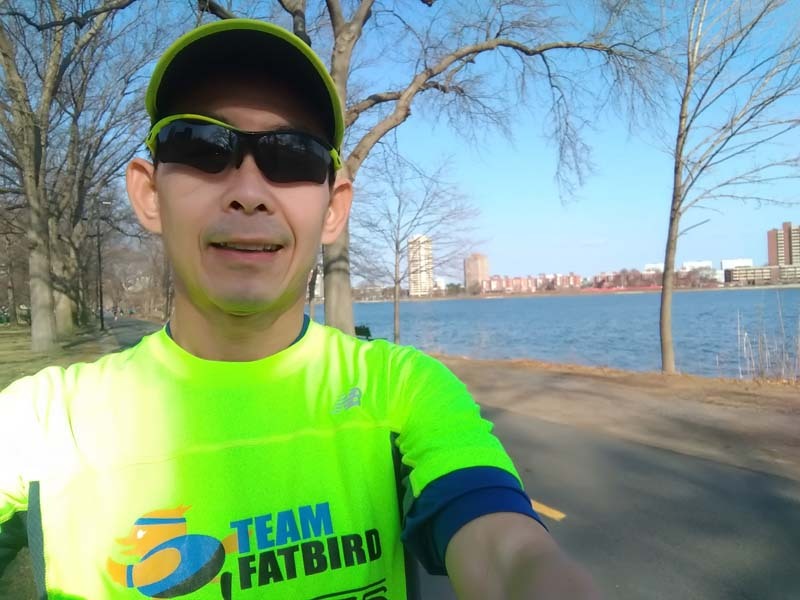 This is my second Boston Marathon – I attended my first Boston in 2016 and have since been able to qualify for this prestigious marathon every year all the way to 2019. This time I was pretty much traveling alone and staying in a hostel to really get down onto the ground and meet different folks and experience some aspects of Boston which I would not have been exposed to if I were to go with a packaged tour. I arrived a day earlier this time just to have a bit more time to spend at the race expo. 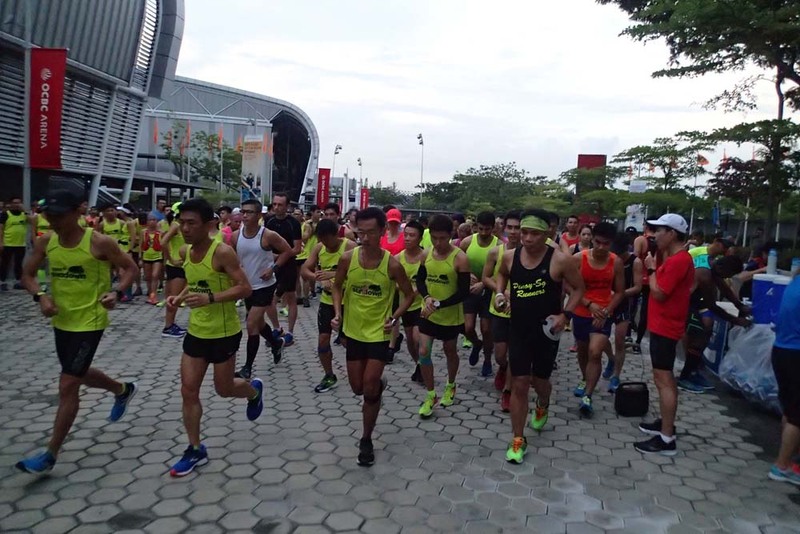 This year’s race expo was a lot bigger than my last visit in 2016. 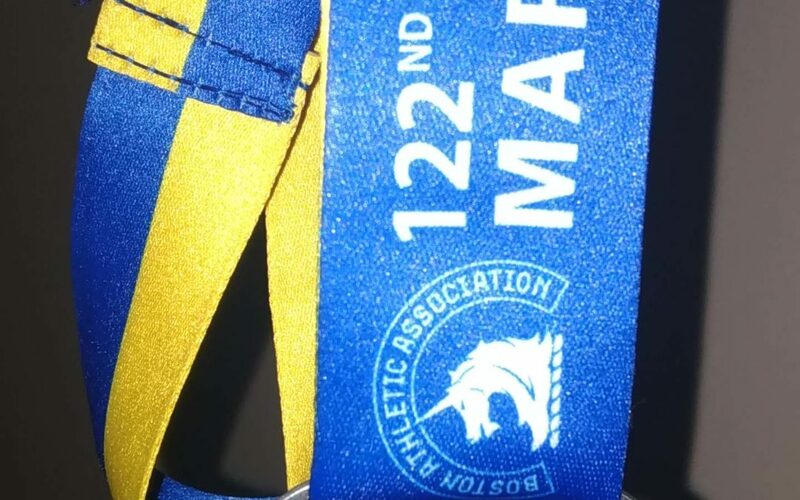 I managed to buy some coveted Boston Marathon souvenirs and sample many of the running products. There were very good discounts on the final day of the Expo (with 50% off from Skechers Boston shoes and more) as I found out from my room mate later. As I promised myself that I would not be back for another Boston race until I enter a new age group in 5 years’ time, I decided to do a little bit more souvenir shopping than what I normally do (which is very minimal to say the least). 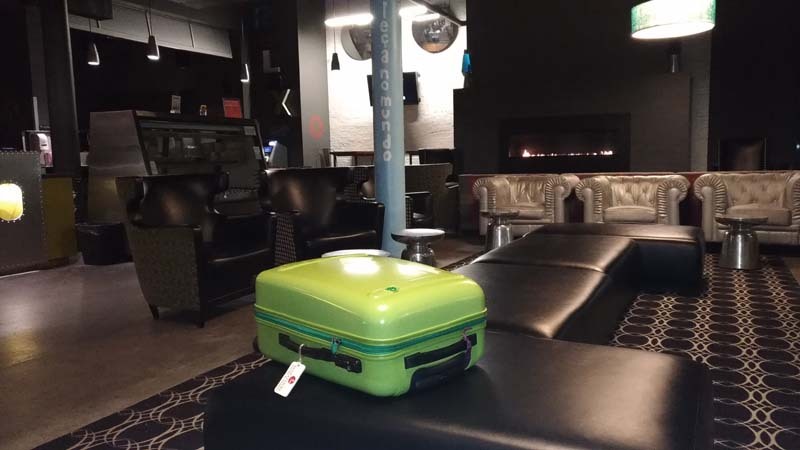 Another first for me was to stay in a Hostel (recommended by fellow Boston Qualifier PS) which I was pleasantly surprised with the coziness and hospitality support for runners and marathoners. 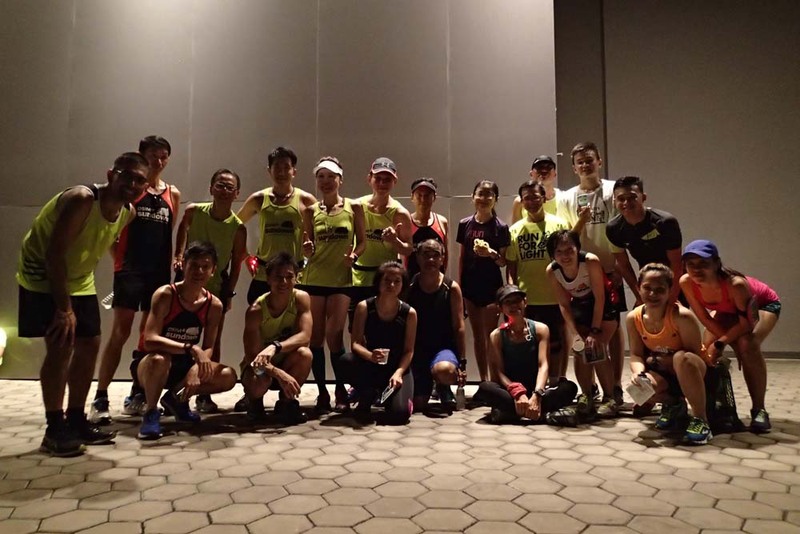 I also got to meet a bunch of very fast runners from HK and US which was quite fun. The value of the stay was excellent and I would recommend it should anyone come to Boston on their own for running or just sight-seeing. 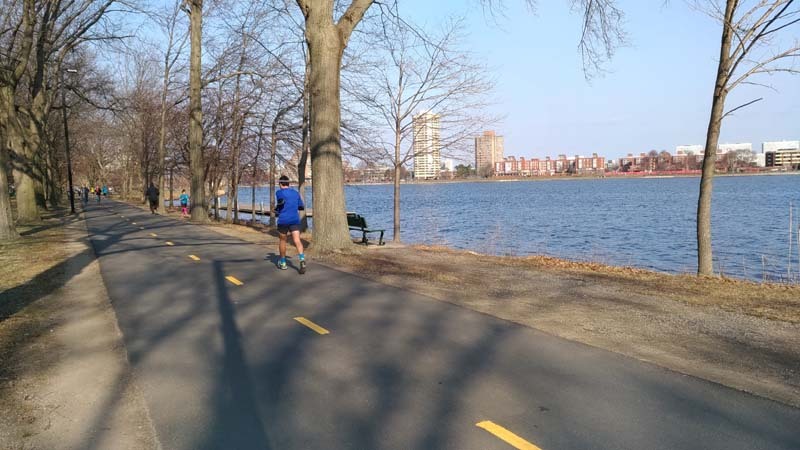 I went for a morning shakeout run in day 2 along the Charles River. The weather was great and warmth provided by the good sunshine. I saw many runners preparing for their race on Monday, including Meb Keflezighi (which incidentally I saw running at Charles River in 2016 as well). After the nice 8km run, I enjoyed a hearty breakfast provided free by the Hostel and the options was just great for me. 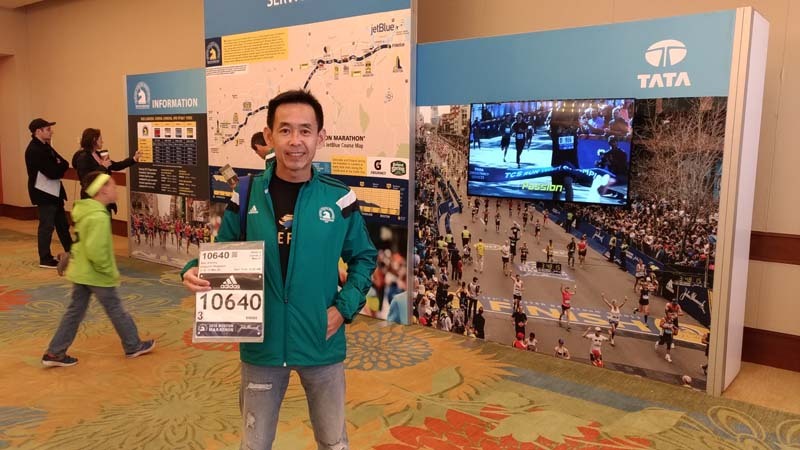 My first trip to Boston Marathon in 2016 was on a travel package which included carbo-loading dinners and transportation to race sites and overall race management. This time around, I had no welcome dinner, and so I decided to try out the free Pre-Race Pasta Party for all Boston Marathoners at the City Plaza. It was chilly cold and we were all freezing while queing to get into the Pasta Party. There were some complaints of people having to stay out in the cold risking hypothermia in the very cold Boston weather. After waiting for about 45min, I finally entered the City Plaza to be given a carton food box, and a few scoops of vegetables, Pasta, and some cutup sausages. We were then ushered into the hall and it was a challenge again to look for available seats. 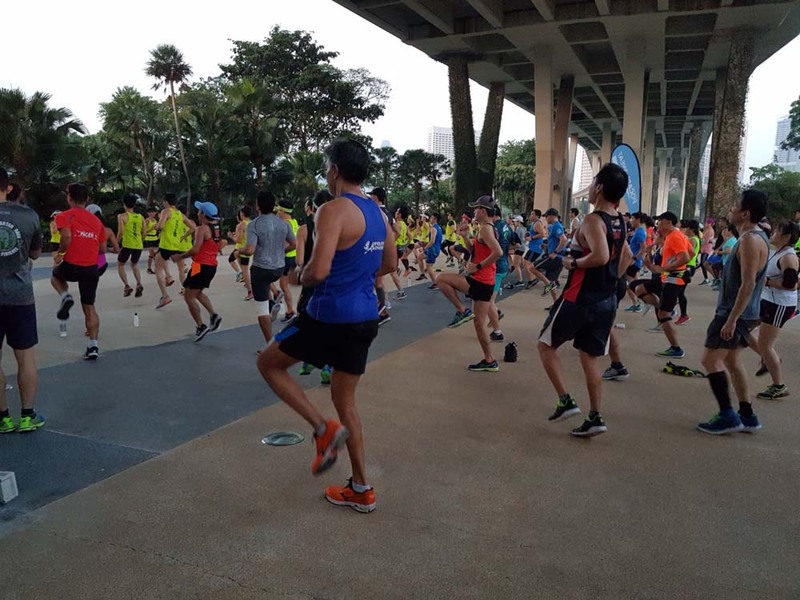 Of course, there was the main highlight of beer and entertainment for those who were in the mood for get some energy into their system. I had my quick fill and got out back into the cold towards the Hostel in double-quick time. I would say it was not too enjoyable an experience, especially in that cold weather. Definitely not worth my time, but still it was a good experience for me. 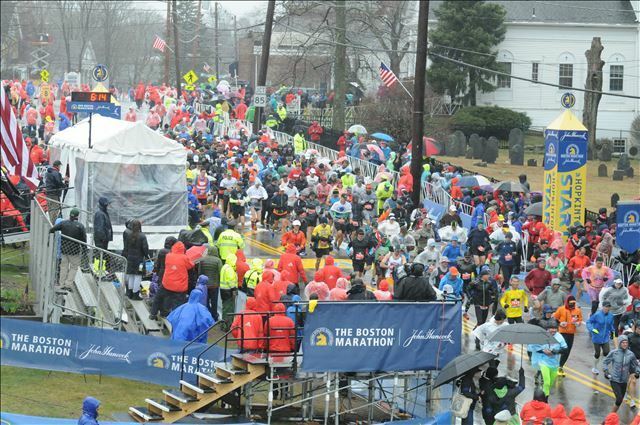 The weather as forecasted would be one of the worst in Boston Marathon’s history, and it was proven right. 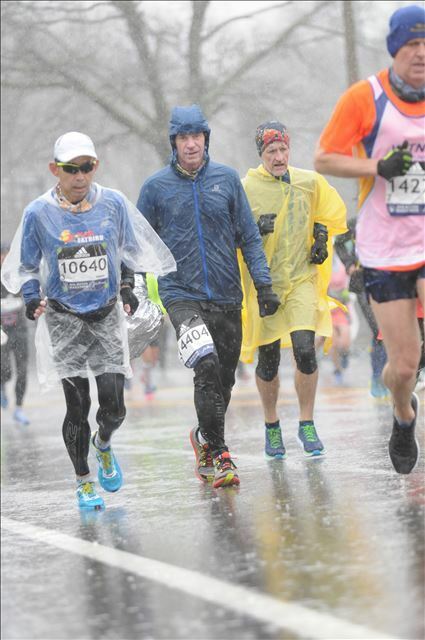 Snow, Rain, Head and Cross winds and temperatures of 0-5C make this the worst conditions at the Boston Marathon in 40 years. Right from the start when we queued up for the buses at Boston Common to bring us to Hopkinton (Start Point), it was raining and temperatures were freezing with the drafts from the wind. 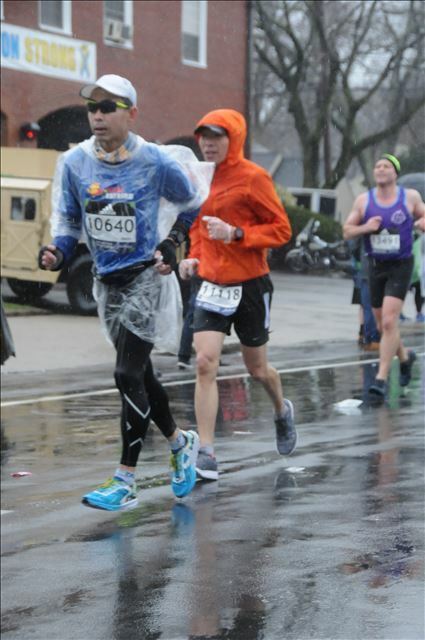 It was really miserable for anyone out in the open, but the spirits were high among the thousands of runners, many of them going for their maiden Boston Marathon race. I went with my HK room mate on that bus which took about 45min to Hopkinton. 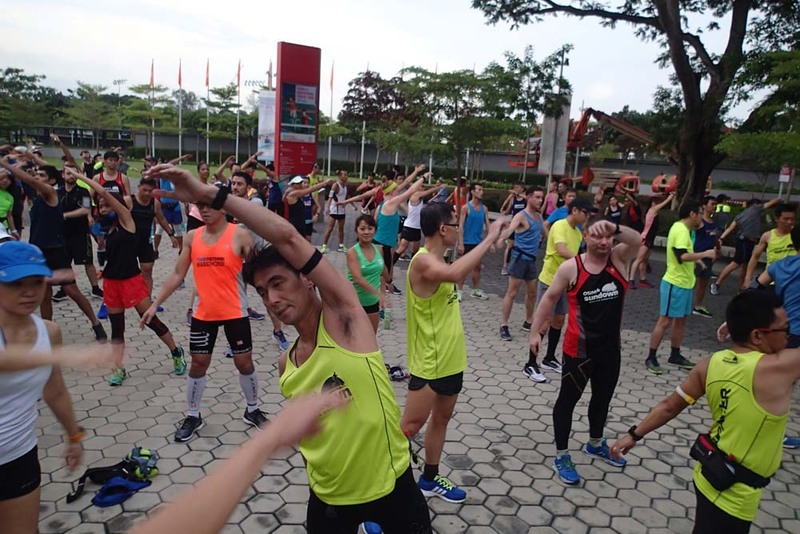 When we reached the start point, it was a mess at the tents provided – the grounds were all muddy, and there was hardly any place for runners to gather. The weather was freezing, and I was just staying quiet hoping to get to the start of the race without getting frozen first. 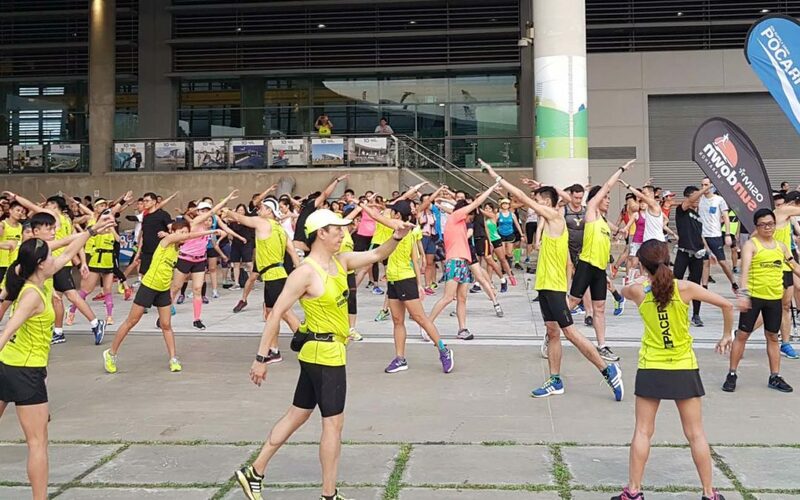 Race reports already had it that all the elites and top runners were decked out in jackets for rain and wind protection, something that is hardly seen among the top runners in any marathon race. 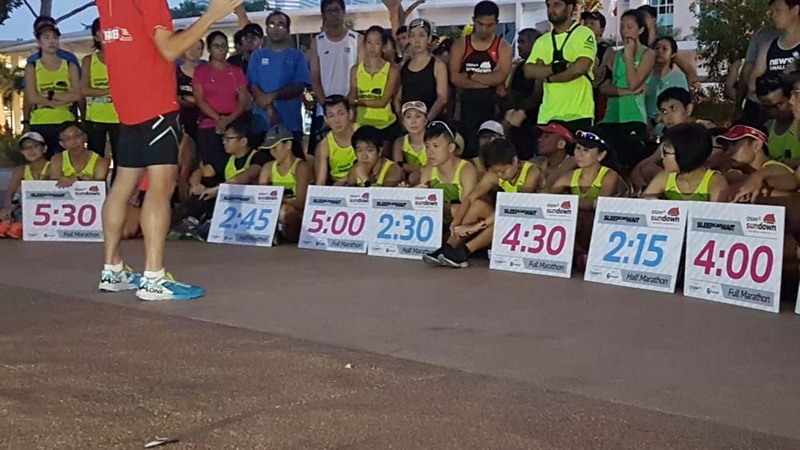 They even had 2 bibs for the elites to place one each on their race singlet and one for their jacket. 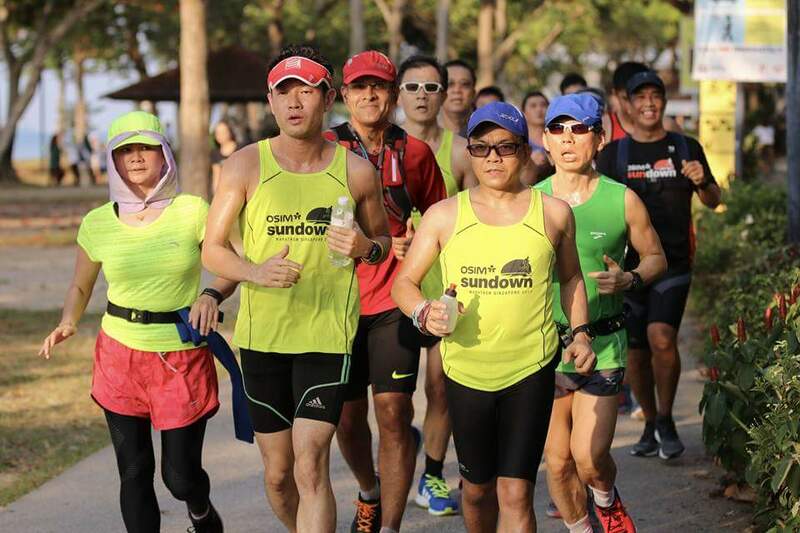 Most of them ran through the whole race with their jackets and head wear on. I was considered underdress although I did put on a non-waterproof jacket to keep myself warm at the start. Soon it was time to enter the corrals, but it was rather chaotic as nobody could hear the announcements as they were hiding away in the tents. 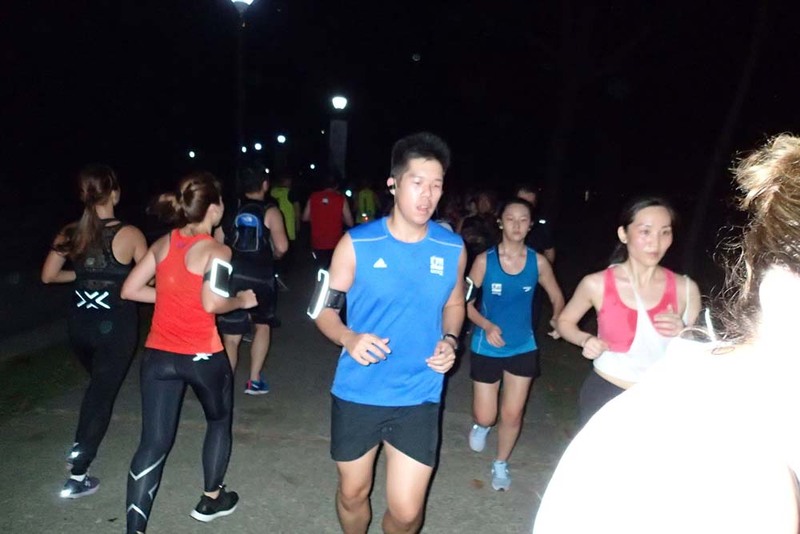 I rushed to the start point in my Wave 2 and Corral 3 grouping, just in time to run off with everyone. 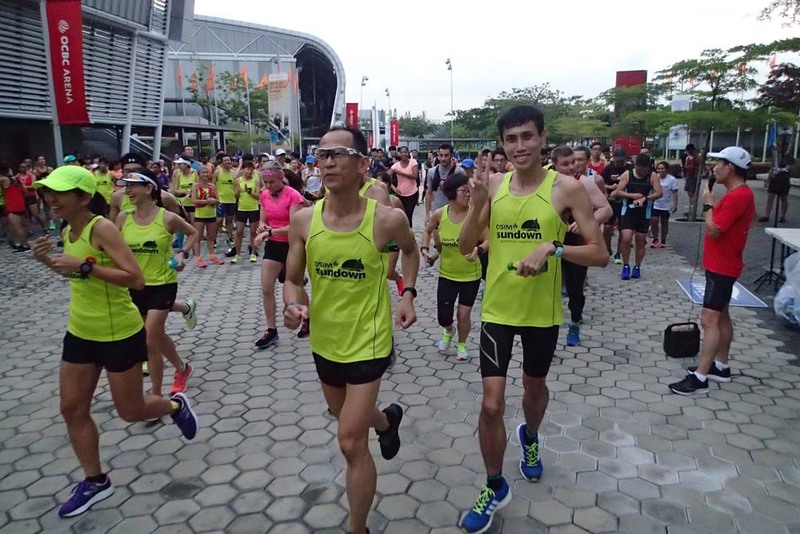 It was raining still and my shoes were wet (after I took off the plastic bags used to cover them, something learnt from the experienced runners used to such weather conditions). 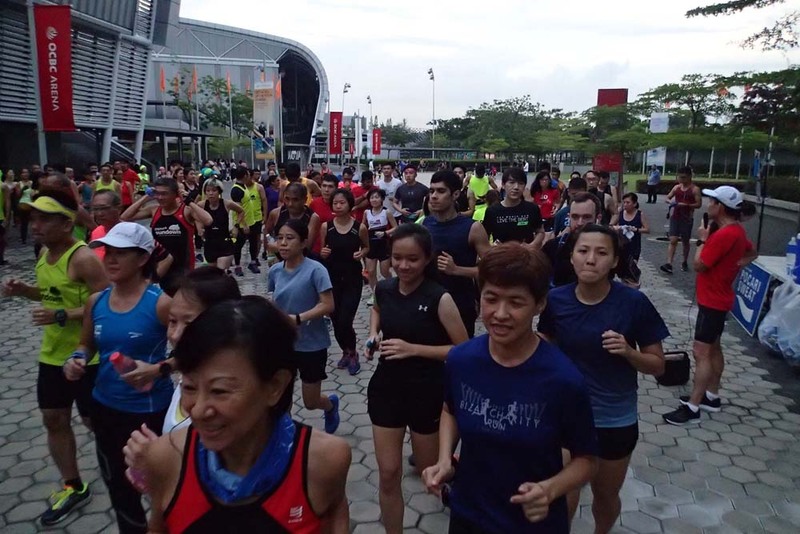 I tried to get warmed up in the first 5km downslope segment but yet avoiding from running too fast. It was challenging to get the body and legs to kick into action as it was shivering cold. 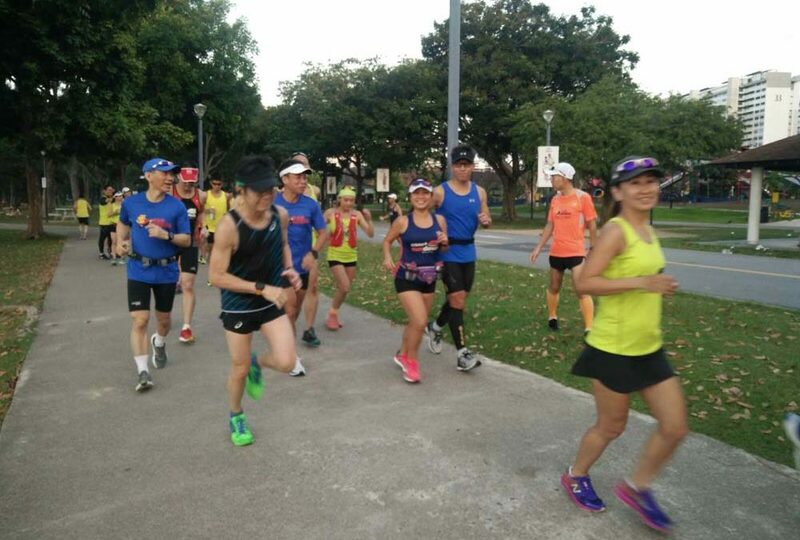 By the 7-8km, the rain seemed to have abated and as I felt slightly warmed, I threw off my jacket – which was a mistake. The headwinds started attacking at 10km and then all along till the end point. 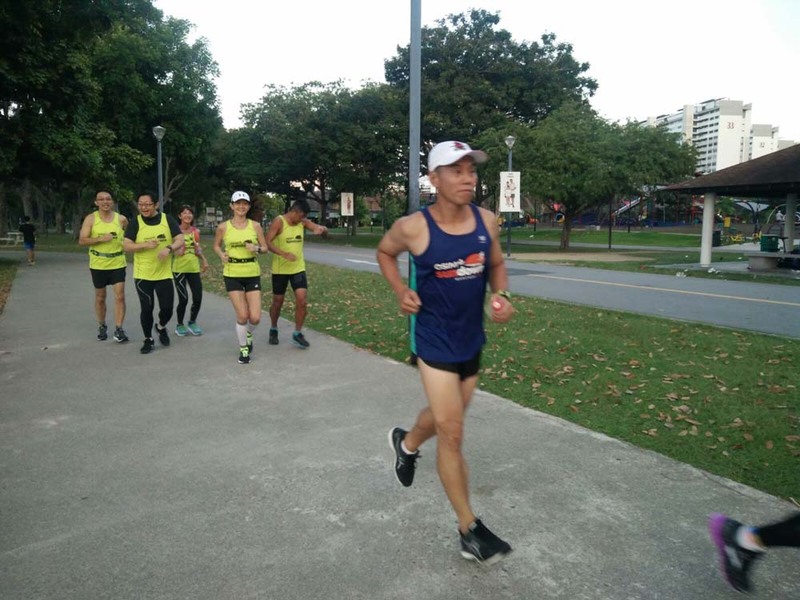 I was looking for cover among the bunch of runners, and they too were swerving around to look for cover behind one another. My hands and fingers were numbed from the cold and I had trouble feeling for my gels and electrolytes. I spent loads of time fumbling with my waist belt and mini poncho which I had on and that really got to me. This time, the Wellesley Girls at the 20km mark was a thinned down force, although the screams were just as loud. I was struggling to keep up with the pelting rain and cold winds at the point that I didn’t really hi-5 that many of the supportive girls. 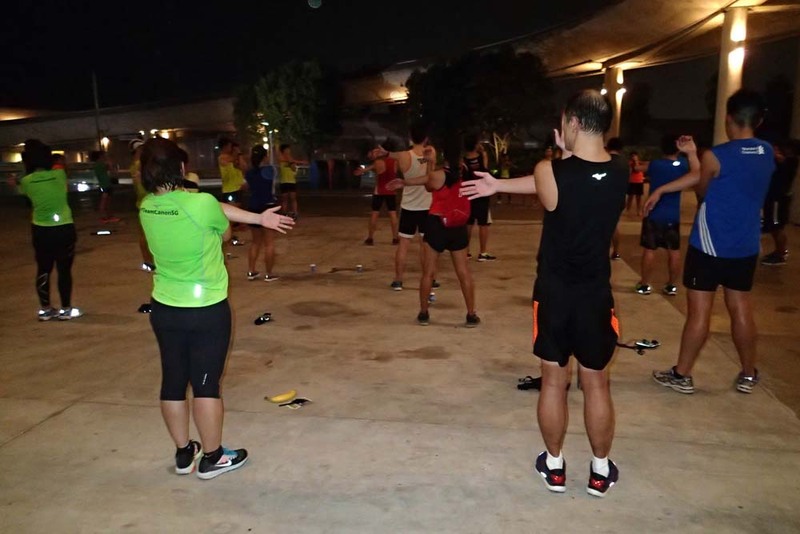 My hips and legs were having problems firing and I felt my strides shortened as I had trouble lifting my feet. I took my usual hydration and gel ingestion, and the energy levels were being sustained. The Newton Hills and Heartbreak Hill came to me as a welcomed break from the long downhills which I felt added on to the stiffness of my legs. 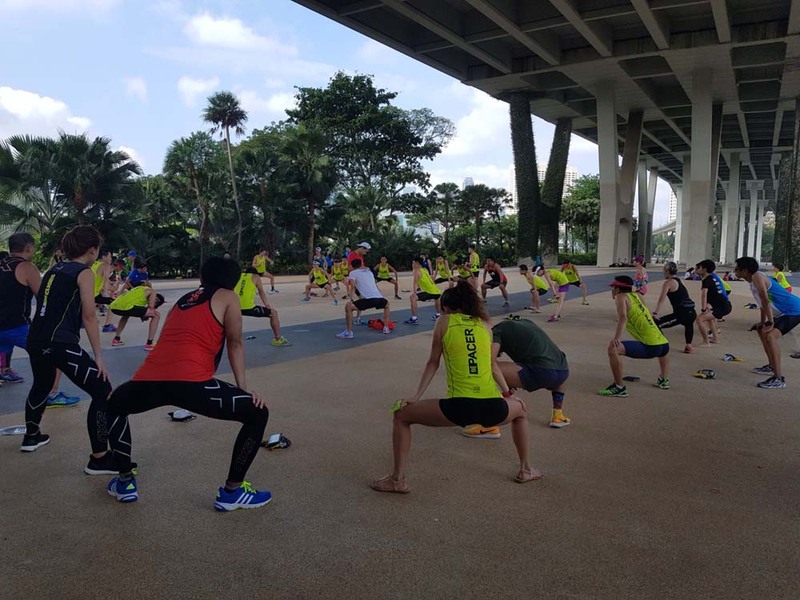 But, it was mainly the chill factor that took a toll on my lower back and glutes. My body was contorted with my hips forced back. I could hardly run tall although I did try very hard. My legs didn’t feel they belonged to me and were just going haywire with erratic short strides causing me to having to put in lots of effort just to maintain balance on the feet landings. 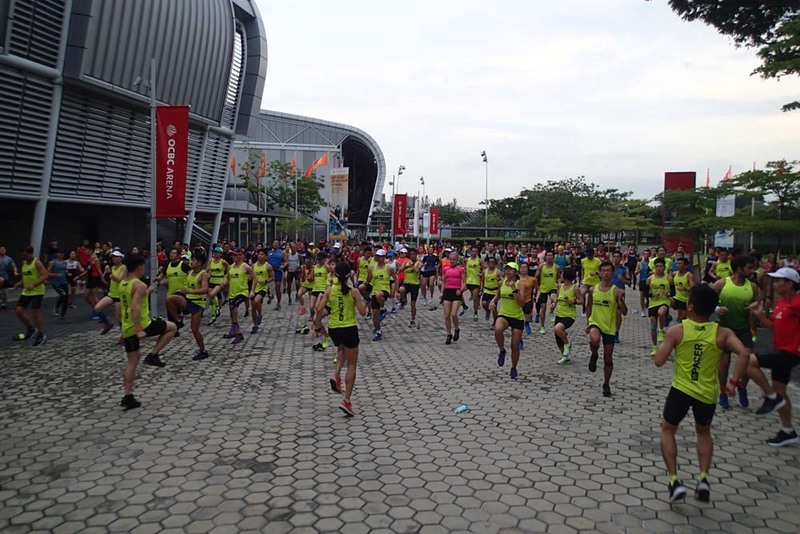 From the 25km onwards, my race was essentially shot. I was just gunning to complete at all costs. 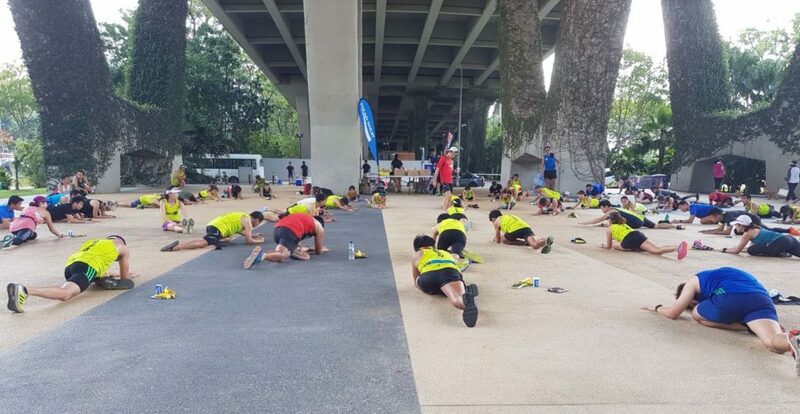 I told myself I would not DNF no matter what, although it looked tempting with so many of the runners visiting the medical tents set up all along the way. The supporters really encouraged us and they sympathized with us having to go through those horrendous weather conditions. They did their best to lift our spirits, but we were so focused in just trying to keep moving out there. Once we stop, the race would be over. 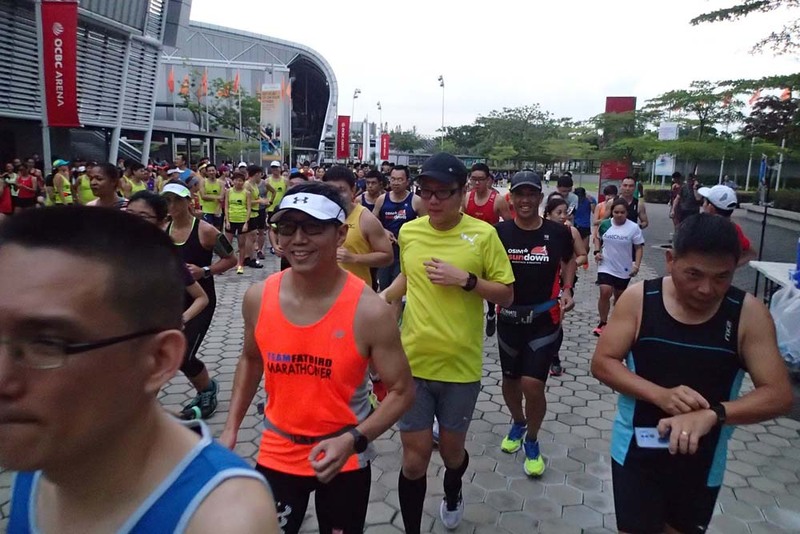 The last 10km was the worst I have ever encountered in my 15 years of running marathons. My paces dropped from 5min/km to 6min to 7min and even to 8-9min. 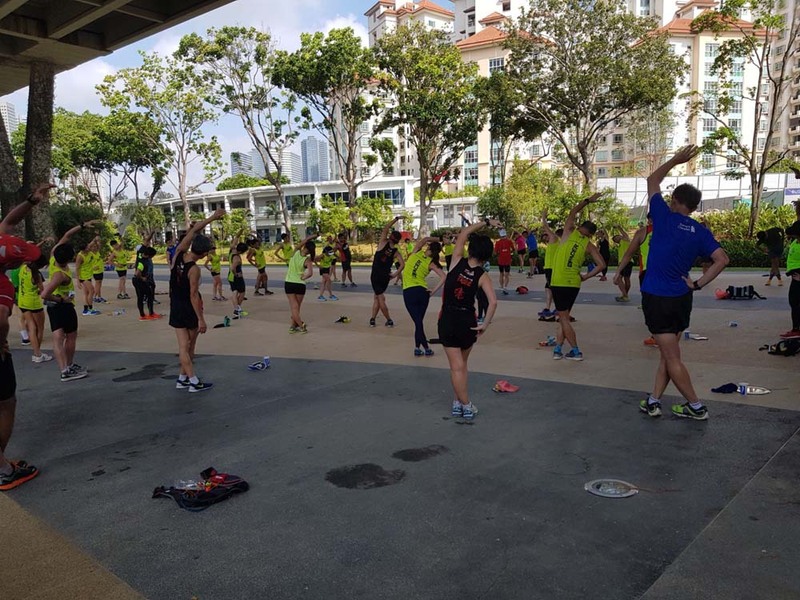 I was just shuffling as my legs were so stiff they could not bend at the knees at all. I was not in pain nor was I fatigued. 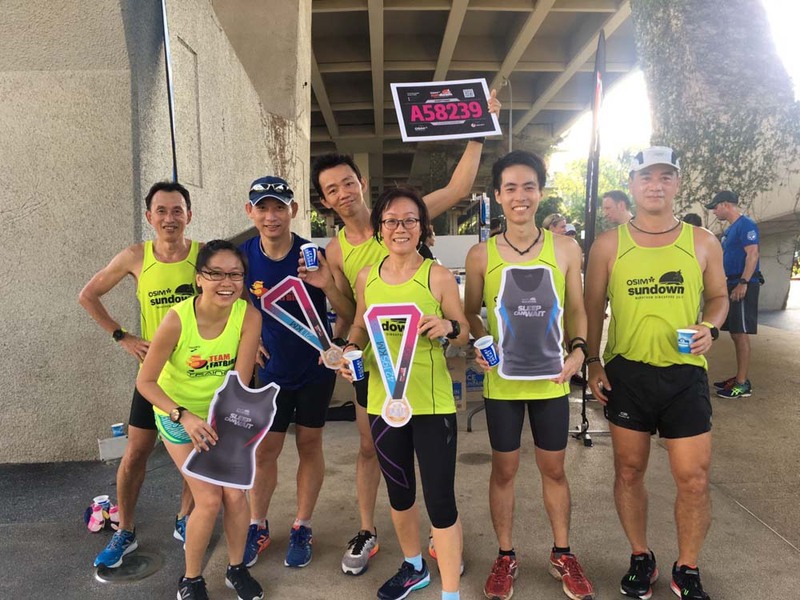 The cold was just too much for my body, and I was lucky not to get into any hypothermia disruptions – there were many who had to DNF due to this, including elite marathoners. 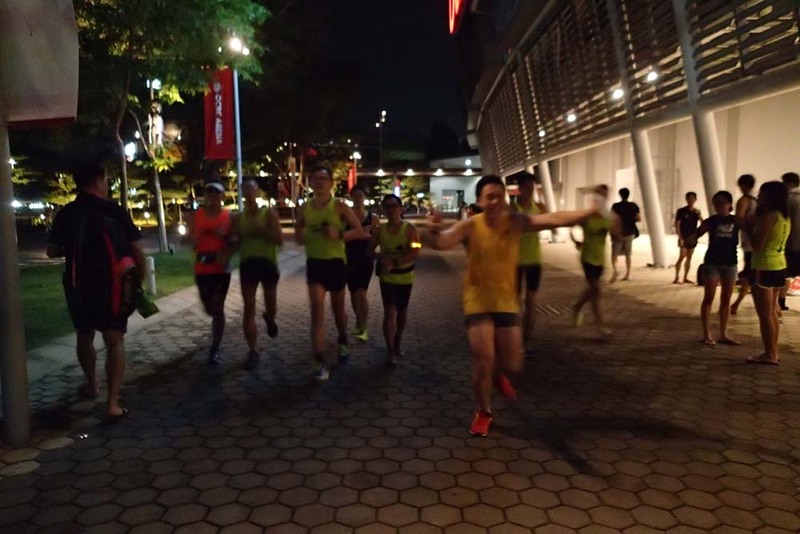 The final 5km was a real struggle. At some points, I stopped to walk as my legs just could not be lifted. Even walking was a problem, but I had to keep moving just to get some warmth generated. 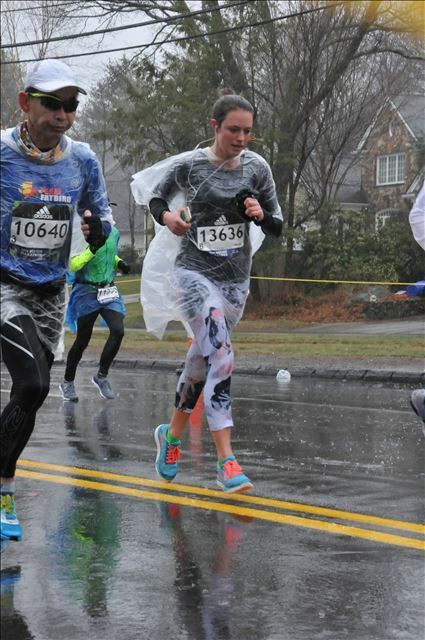 The run to the finish at Boylston Street was just pathetic for me as many runners from the waves behind overtook me. I staggered to the finish after mustering all my senses, and literally collapsed into the arms of a Volunteer Marshal. I asked if I had finished, else I would continue to run on. 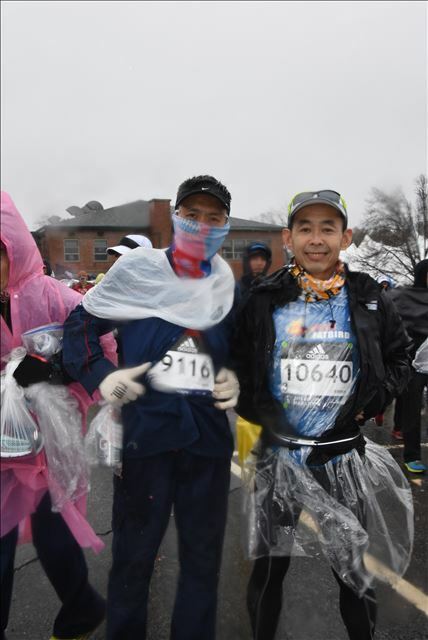 He confirmed that I crossed the Finish line and helped me to get my heat blanket. I was just plain shivering and my mind was just set on walking the 1km back to my Hostel as soon as possible. I bypassed all the photo stops, food and goodies handout. I staggered all the way to my room in a zombie-like state, and just slumped down when I finally arrived. I quickly took off my wet clothing and went for a hot bath. It took 20min for me to warm up before I felt much better. It was surely the hardest marathon or run that I have ever done. My room mates and media reports later would confirm that many elites and runners have suffered and dropped out of the race. I was just grateful that I completed in one of my worst marathon timing (4:02 nett) to get my beautiful Unicorn Medal, something that many all over the marathon world so covet. 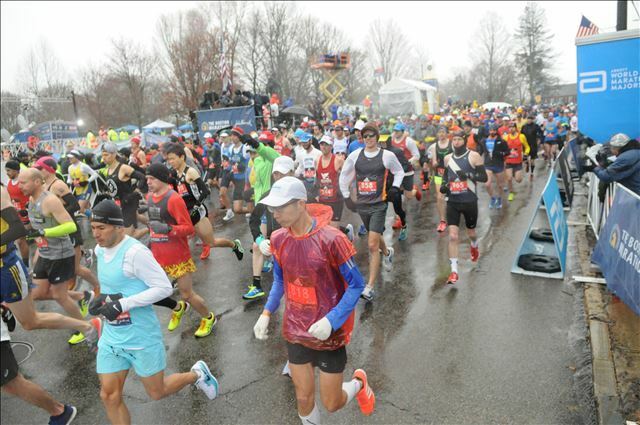 The overall Boston Marathon race organization was immaculate, even in such adverse weather conditions. 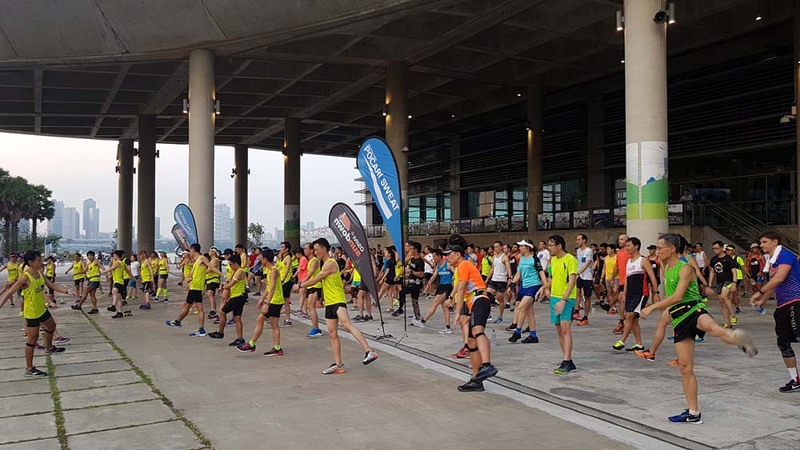 All the great stuff from the race pack collection and expo, transportation to start-line, race day crowd and entertainment, hydration and fuel support as well as post-race gear-checks and warm blanket / food distribution were as good as in past editions. The race jackets, tees, and medal have larger logos this year which was a plus factor for most of the Boston Marathoners. 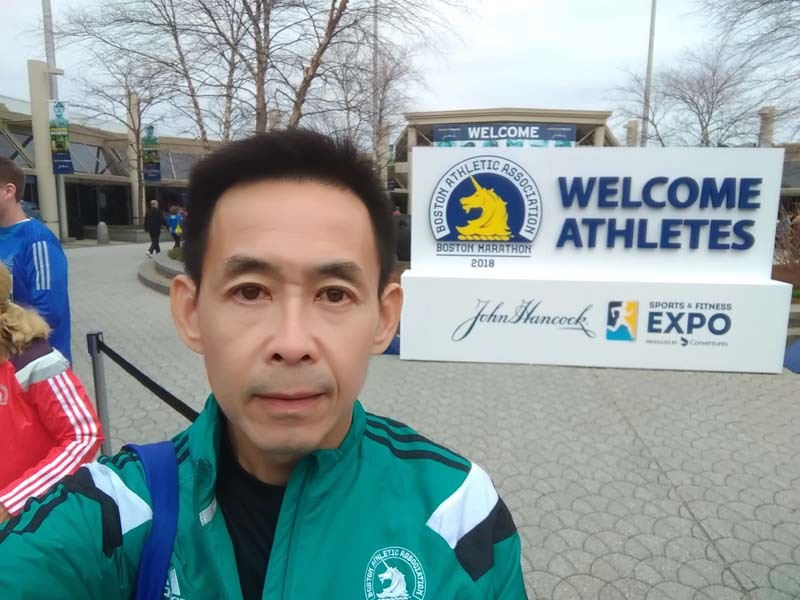 It was a very good experience this time at Boston Marathon 2018. 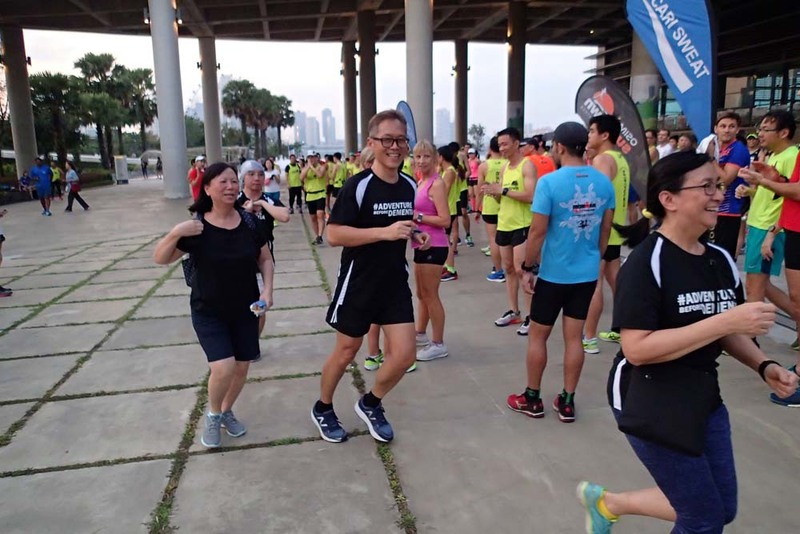 I have learnt valuable lessons which will put me in better stead when I tackle the New York Marathon later this year as well as the other World Major Marathon races. 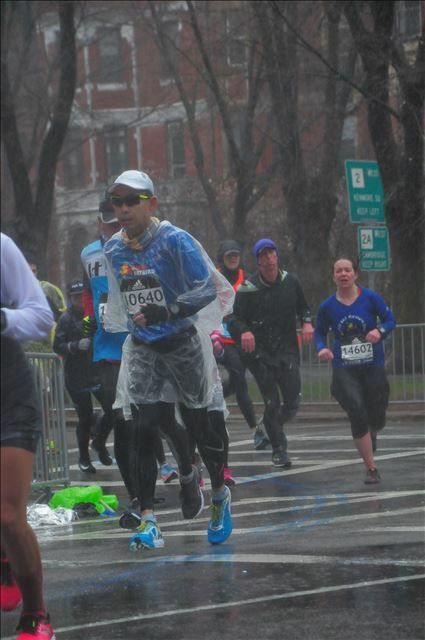 The most challenging Boston weather conditions have toughened me mentally, and to some extent, physically. 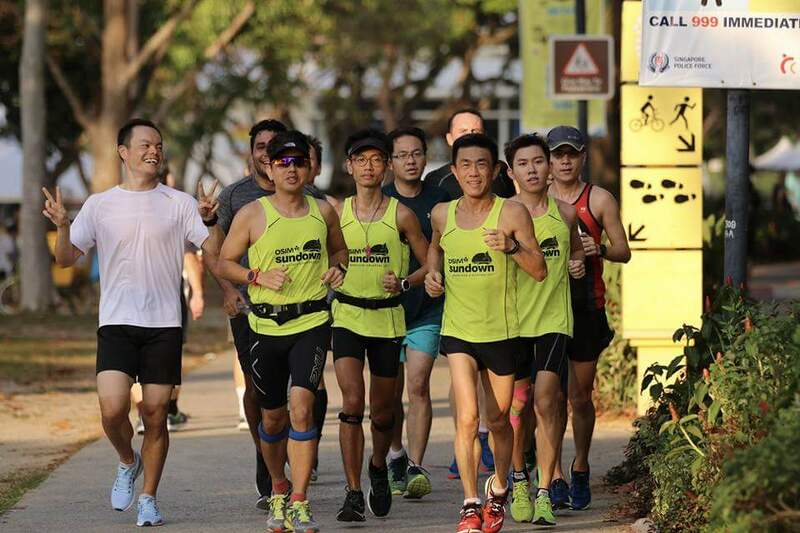 I believe it has developed my tenacity and propensity for ‘pain’ tolerance during tough race conditions to be able to compete and complete in future challenging races and even in everyday life’s challenges. 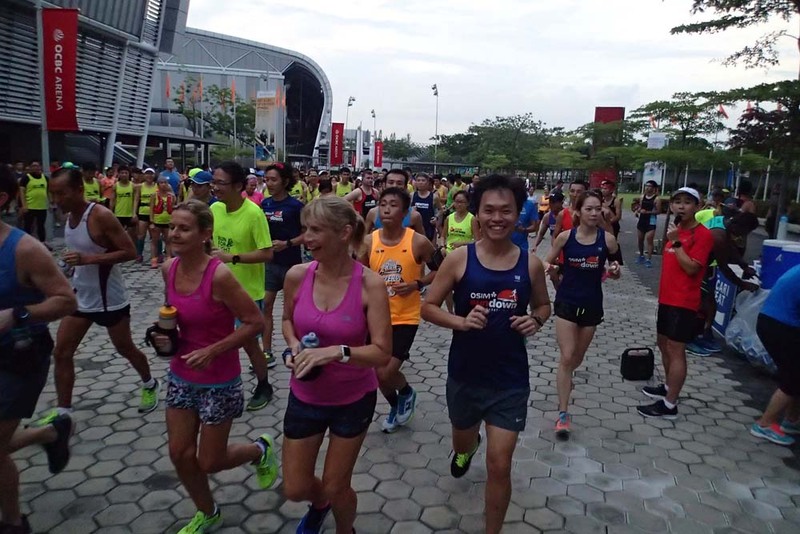 Although I did not get to meet up much with our Singapore counterparts, I had more time and exposure with new friends and fellow marathoners from all around the world. 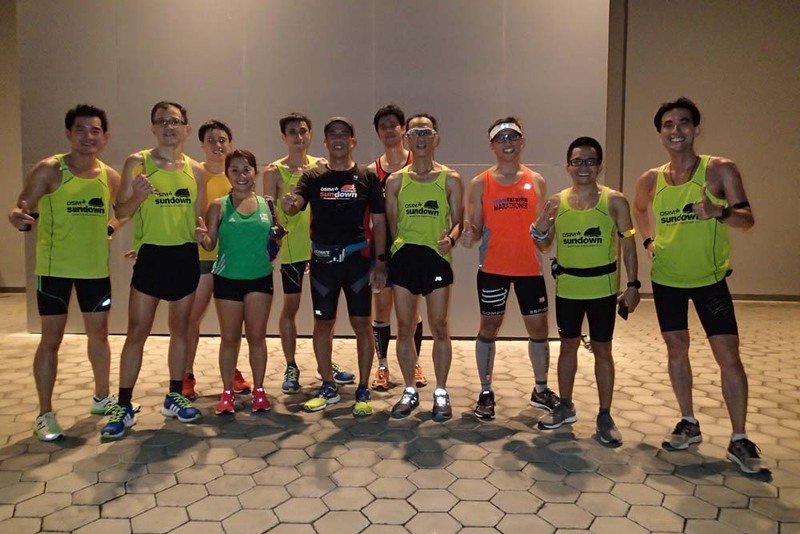 It was interesting to compare and contrast their practices and preparations for training and racing marathons. 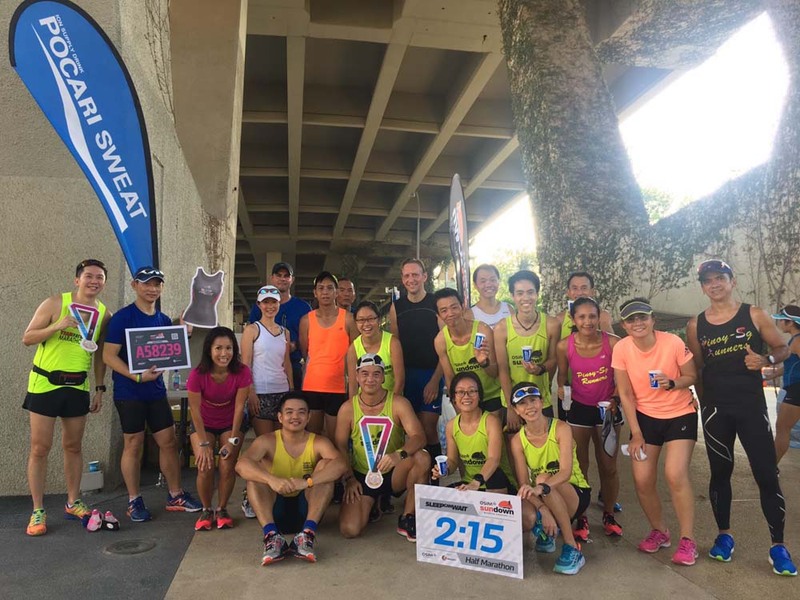 These Boston Marathoners were all united in updating one another the latest weather status, sharing their various methods of running in such wet and cold conditions, chatting about the food and training they do back home. They were all so focused in achieving their racing goals. 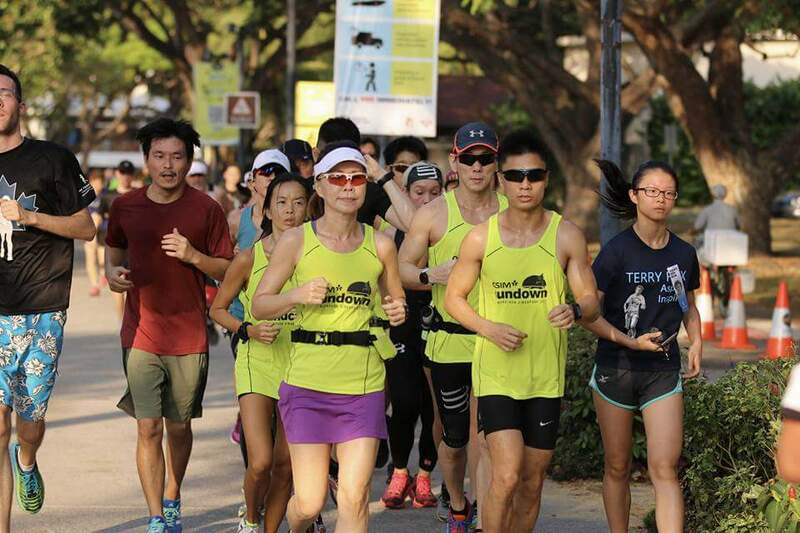 There was so much I have learnt from them and there will be much more to learn from my future participation in international marathon races. 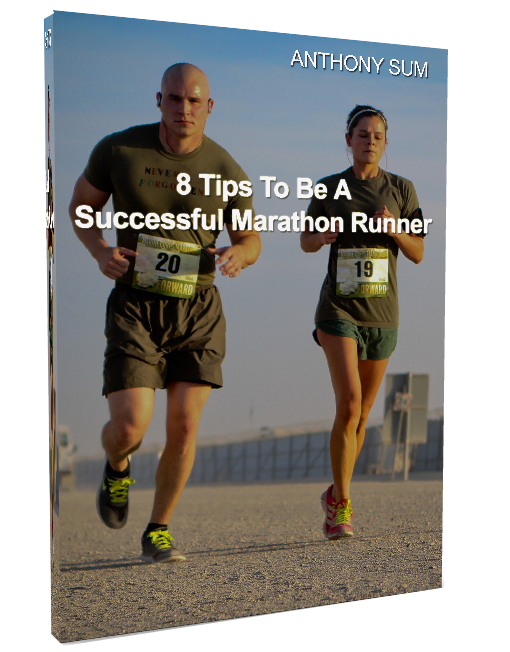 I look forward to my next World Marathon Majors race in New York where I should be better prepared for from my Boston Marathon experience. All who wish to hear or find out more about my Boston Marathon 2018 learning can PM me separately. 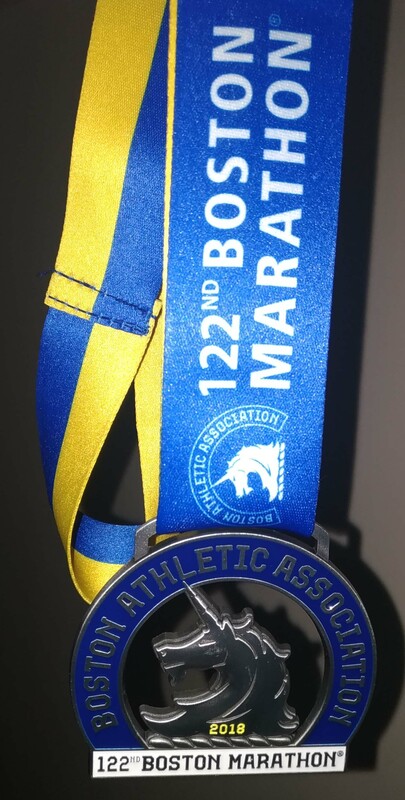 Till my next Boston Marathon in 2023!